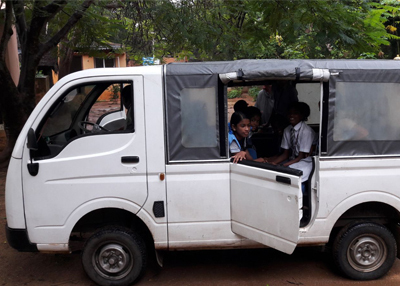 We currently use 2 vehicles to meet the children’s needs: a Mahindra bus with 16 seats and a 7 seater ‘Tata Magic’ mini-bus. The children are educated in a variety of schools spread throughout Pondicherry, and the two vehicles serve as transport for the daily commute of around 40 children. The Tata Magic has great maneuverability, which makes it indespansable for a number of other jobs too, such as shopping, visits to the hospital, and taking children to specific classes and clubs. The vehicle is now getting old: we bought it back in 2010 and it now has 173 000 km on the clock. The cost of servicing it is getting considerably higher and if it has a major break down we will have no alternative but to replace it. That is why we now plan on buying a new replacement. Un immense merci au Rotary Club d’Auxerre pour leur générosité !